Fitness enthusiasts and even average gym goers are raving about the best protein shaker bottles in the market today. It makes life so easy and convenient for them. The idea is unique and simple – a plastic bottle that comes with a wire whisk to smoothly blend the protein shake. Since its introduction in 2004, it has slowly grown popularity up to present. When it was first released in the market, shaker bottles’ purpose was just to mix your protein shake. Now, products have become more advanced and present more features. Finding the perfect protein shaker bottles really depends on personal preference. So, continue reading below to gain an idea of what’s best for you. What is a ﻿Protein Shaker Bottle﻿? Why Do I Need a Protein Shake Bottle? Basically, the purpose of a protein shaker bottle is to mix supplements and protein shakes. It has grown more modern in the past years and have evolved into have a wire whisk ball. Its purpose is to mix the protein powder and other ingredients thoroughly with the main goal of having a smoother drink. Many brands are currently exploring to further enhance the regular shaker bottle into a more complete nutrition container. Because of this, they are adding more space and compartments to the bottles, allowing for more liquid or drinks. Some even have the space to store your things like keys, money, pills or cards. Lastly, recent shaker bottles are able to mix very thick ingredients without the use of a blender or machine. Users can make omelet, protein desserts, or even pancakes. This flexibility of use is enjoyed by fitness enthusiasts because they can use it for their diet too. Just like any other product, price can go higher as each bottle gives more unique features. Manufacturers create them using many different designs and materials so prices can vary from tens to hundreds of dollars. But just like finding the best protein shaker bottle, the right price for you also depends on the quality and features that you prefer. This stainless-steel bottle from Kiss Me Organics has a simple and sleek design. On the outside, it has measurement markings printed in ounces and milliliters for convenient measuring. It is made of a double wall with a vacuum layer to ensure insulation, effectively keeping the temperature of your cold and hot drinks. There are no plastic parts that come in contact with the liquid inside so the bottle keeps your beverage safe and uncontaminated. You are sure that this product does not contain harmful chemicals and is totally BPA-free. The bottle opening has a wide mouth allowing you to conveniently mix in your protein powders and supplements into it without creating a mess. A stainless-steel shaker ball is also included for shaking up your drink to keep the contents of your bottle freshly mixed as you drink your beverage. Overall, this is a very useful and convenient protein shake bottle to bring along. The brand also guarantees warranty for manufacturing defects within 1 year and that includes accessories too. With this, you are assured of a product with the best quality. The Hydra Cup Dual Threat offers an innovative and unique protein shake bottle. With its high-performance double compartment, it provides perfectly mixed drinks throughout your workout. This shaker bottle can replace your other bottles because you can fill both sides with the different ingredients. The Hydra Cup is one of the best shaker bottle that let you carry two drinks in one bottle. The bottle and its parts 100% manufactured, designed, and assembled in America, ensuring premium quality and standards. It is BPA and chemical-free which keeps your drinks safe with any temperature. The huge bottle can accommodate a total of 28 ounces so you can carry more of your favorite drinks. There are a variety of designs and colors to choose from. Even flip caps are differently colored. The bottles have different slogans written which are great motivations to push you to your end goal. Despite its large size, it can fit into cup holders perfectly allowing you to conveniently take your drink while working out. The Hydra Cup was originally made to carry your pre and post workout drinks but you can also use it to keep your shake on one side and hide your belongings in the other. What’s more is you can share the cup with a gym buddy, each of you having your own side! BlenderBottle is one of the most well-known brand in the protein shake bottle industry. They’re taking the market by storm because of its versatility. What’s to love with this product? It is made with very durable Eastman Tritan plastic that is both stain and odor resistant. It is dishwasher safe for easy cleaning, and also BPA and phthalate-free. 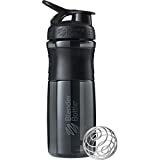 The bottle comes with a surgical-grade steel whisk inside called the BlenderBall that effectively keeps your drink mixed. BlenderBottle also has a secure screw-on lid with leak proof guarantee, so you are sure that your drink is safe inside, preventing mess and blowouts when drinking. It is easy to carry because of its convenient SportLoop. You can easily pick it up with your fingers. You can also firmly hold onto the bottle with its stylish rubberized SportGrip that won’t slip off your hands during your workout. It has ounce and milliliter markings for accurate measurements of your protein powder. We go through hundreds of products listing at Amazon and also study the ratings left by previous buyers to find the best protein shaker bottle for you. Besides that, we also calculate the overall net ﻿﻿customer satisfaction (NCS) grade because we want to see how happy is the previous buyers with their purchase of the product. From our finding, we can say that Kiss Me Organics, Hydra Cup and Blender Bottle are the best protein shaker bottle brands. These brands are popular and received many excellent ratings for their products. 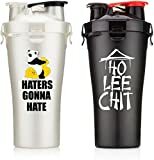 Also, the Kiss Me Organics Stainless Steel Shaker Ball Bottle, Hydra Cup Dual Threat and Blender Bottle Sport Mixer Tritan Grip Shaker Bottle score favorably for the ratings as well as the NCS grade compare to the rest. We believe that you would find these protein shaker bottle a good buy too. One of the ways to create a smooth and properly mixed protein shake is to use a blender. Unfortunately, this takes time because you’d have to plug it into a power socket. Furthermore, it bulkiness wouldn’t allow you to conveniently bring it with you. The new shaker cups that are available nowadays make it possible to keep the liquid and powder in separate compartments. By the end of your training session, you have a freshly mixed drink. Other than that, you can use your bottle to store your pre-workout beverage. Many fitness enthusiasts store their drinks, supplements, pills, and snacks inside their shaker bottle. With this, carrying the things you need for your workout is easier and more convenient. There are many kinds of bottles to choose from but how do you know which are the right ones? Here are the certain things to look for in finding the best protein shaker bottle. One of the most important things to consider is the bottle’s size. How much drink it can fill in and if will it fit into your gym bag, locker or car. You want a bottle that’s stylish and useful but not bulky. Bisphenol-A for BPA is a chemical that can be found in some plastic products. It interferes with hormones and is found to cause some cancers in both the breast and prostate. It can even contribute to infertility and some metabolic disorders. Because of all its risks, it is important that your bottle is BPA-free. While working out, accidentally hitting your tumbler is unavoidable. But you can prevent the contents from spilling if your bottle is tightly sealed, preferably with a screw-on cap. You don’t want to hit the gym smelling like protein shake. Pick a bottle that is easy to grip with sweaty hands. Some bottles have non-slip rubber sides and handle. There are also some that come with a hook or lock which you can attach to your gym bag. Most bottles are hassle-free to wash but putting them in the dishwasher can give them that extra clean. This makes sure that your bottle won’t build up stinks. Protein shaker bottles should have an agitator ball or whisk inside to break the ingredients apart. This will make a smooth drink and ensure that everything is mixed well. Freezing your bottle is not so recommended but it’s something you should still consider. Most bottles are made with plastic and can break when placed in the freezer. Be sure to keep an eye on your bottle and don’t keep it in the freezer too long. Sometimes, you will also put hot or warm mixes in your bottle. This can build pressure inside and end up flipping the cap or worse, spill the contents all over. You’ll be carrying your bottle around a lot. That includes being constantly tossed in and out of your bag many times. A good bottle should be sturdy and withstand daily use in your activities. It shouldn’t easily break or crack when you drop it, plus it should keep its shape. U﻿﻿sing﻿﻿ a shake bottle to mix your supplements and drinks can make it easier for you. How easy? Here are 4 steps to make protein shake with your bottle. Pour the liquid in the bottle by using the side measurements. This comes in ounces or 7milliliters. Measure your protein powder or any supplement which you want to mix in the liquid. There are usually scoops provided in the supplement tubs, so use that one. Get creative with your drink and add other ingredients. Some tubs come with recipe suggestions but consult your doctor first if these go well together. Lastly, make sure the lid is tightly close and shake the bottle. Count slowly up to 25 while shaking. After that, you can open your bottle and consume the drink! Read the facts and information on the protein shake bottles or tubs. Some may contain extra sugar or artificial sweeteners that can counteract your workout. Keep your unfinished shakes in the refrigerator. They can spoil and sour, stinking up your bottle. Sometimes, stink can build up over time. When this happens, wash your bottle with a mixture of water, baking soda, and dish soap. The baking soda act as odor removers. Most of protein shake bottle can’t easily you reach the bottom of the bottle when washing. Use a bottle brush set to get the job done. Fitness enthusiast or not, the best protein shaker bottles will make your life far easier than a regular tumbler. It effectively combines protein powder or supplements with any other liquid that you want for a smoothly blended treat. Plus, a bottle shaker can replace your bulky blender. However, what a shaker bottle cannot do is making you a green drink. In this case, you still need a blender to make the green drinks or smoothies but use the protein shake bottles to store the drinks for later to consume. The shaker ball will prevent the drink from curdling up when shaking it. So far, these shake bottles are a game changer. These revolutionary bottles are so easy to use because they don’t require batteries at all. They can even be act as storage for other things or be used as a salad dressing maker. This is such a convenient product and can greatly help health buffs maintain their lifestyle.